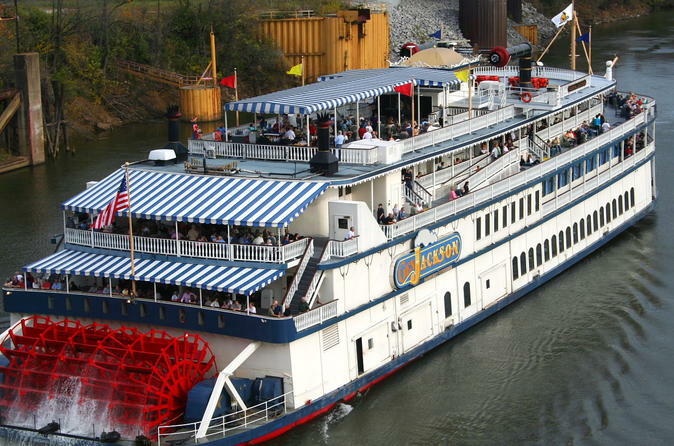 After pickup from your Nashville hotel, board the General Jackson Showboat, one of the largest paddle-wheel boats in the country, and travel down the Cumberland River. This grand vessel was designed to recreate the showboats that plied the waters of American rivers in the 19th century. Admire views of the Nashville landscape as you relax on the indoor or outdoor decks. In the beautiful Victorian theater on board, you’ll feast on a traditional Southern meal. For sample lunch and dinner menus, see the Itinerary section below. You’ll then be treated to live entertainment! On the lunch cruise, enjoy a comedy production full of classic Southern humor. On the dinner cruise, enjoy a live orchestra accompanied by a dynamic cast of dancers in elaborate costumes. After your cruise, you'll be taken back to your hotel.